It is sad that most of my blog posts are related to an SSLVPN client and not my area of expertise, storage. The previous SSLVPN client post is by far the most popular post on my blog, so here is to another post that will hopefully help someone. My previous post on the SSLVPN client can be found here. I had previously been running the NAclient from Edge version 6.1.3 on OS X 10.11 without issue, however the installation will no longer work due to security controls put into place by Apple. There is a trend here, the previous problem with getting the NAclient installed onto OS X 10.10 (Yosemite) was also due to failure to meet Apple security guidelines, they didn’t implement code signing (amongst using deprecated methods of configuring/starting services). 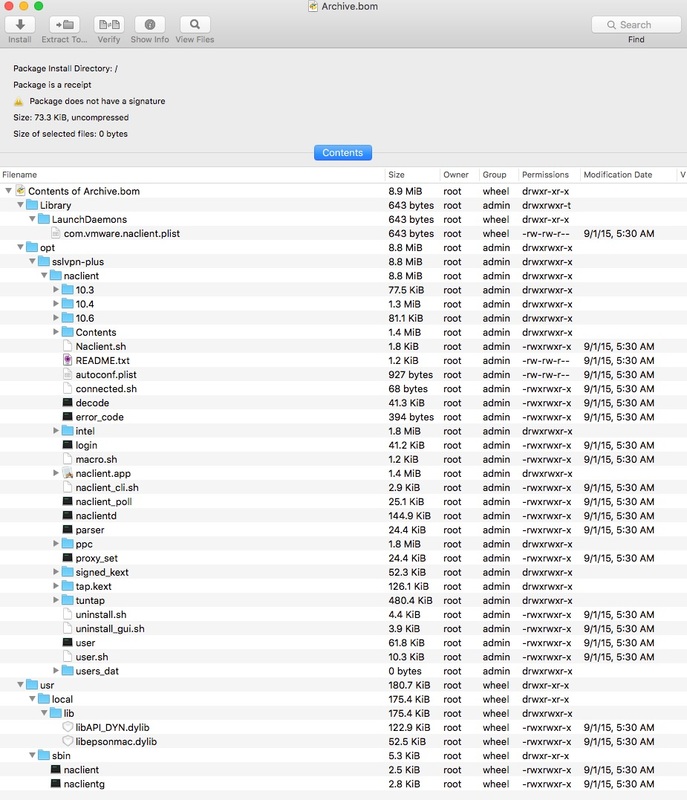 It took some digging to figure out what is going on, and I used one of my favorite tools (Pacifist) to open the actual installer package to see where the installation files are written. 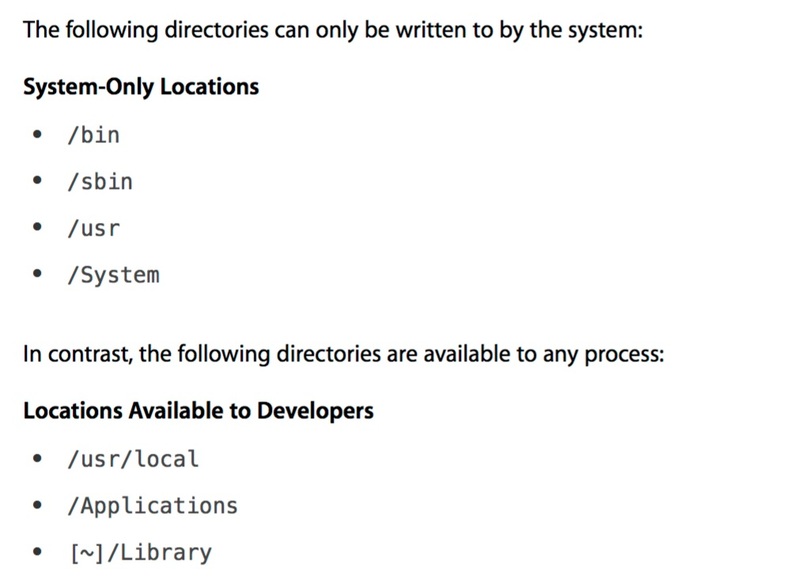 I also remember reading about Apple’s System Integrity Protection locking down access to secure system file locations, including /usr, /System, and others. In researching this I found Apple’s developer guidelines for System Integrity Protection, and it clearly states that /usr is off limits. In order to manage System Integrity Protection you must reboot your system into Recovery Mode, you can do this by holding down Command+R on system startup. 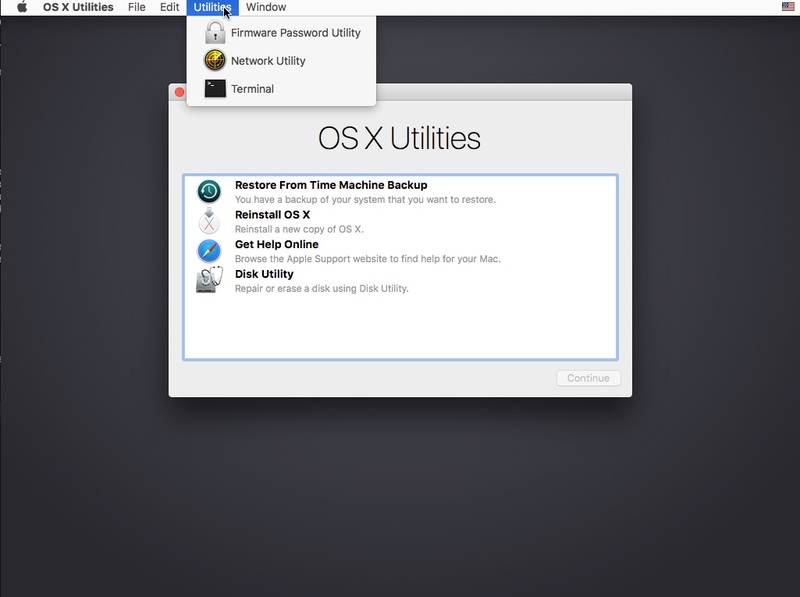 You should boot to a OS X Utilities menu. 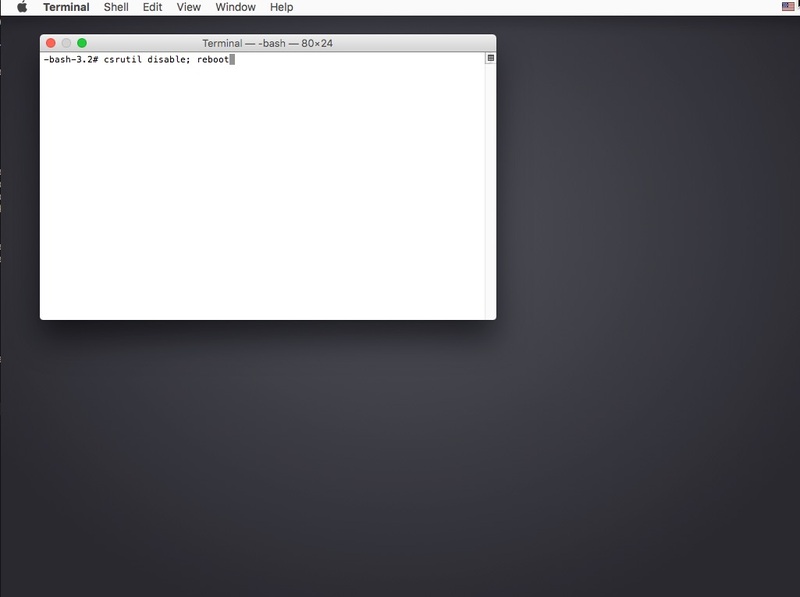 Click Utilities and select to open Terminal. Within terminal you simply need to run ‘csrutil disable’ and then reboot the system, the easiest way to do this is with a single command line of ‘csrutil disable; reboot’. 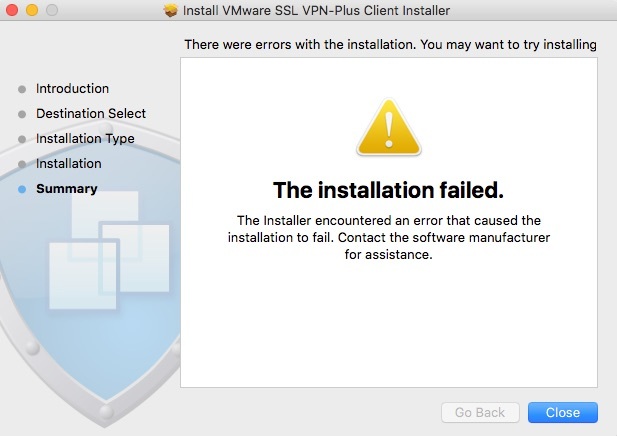 It is becoming obvious that VMware doesn’t take client support for SSLVPN seriously, I will be investigating options to migrate our environments off of SSLVPN within the Edge Gateway. It is entirely idiotic that you must deploy an entire new version (that isn’t even released yet) in order to fix a simple client installer bug. That means you have to wait for the new version of the NSX stack to be qualified and supported by GSS with any of your other software components (e.g. vCloud Director), which isn’t an immediate process. This leaves customers exposed for a long period of time, it increases operational burden for support teams and in general is a horrible way of delivering client software. Client software should be released and maintained independently of the entire NSX Manager/Edge Gateway bundle. Requiring every customer to do a massive upgrade of their entire environment just to fix a bug (that they should have known about months ago and should have been included in a 6.1.x release!) in client software is not acceptable. 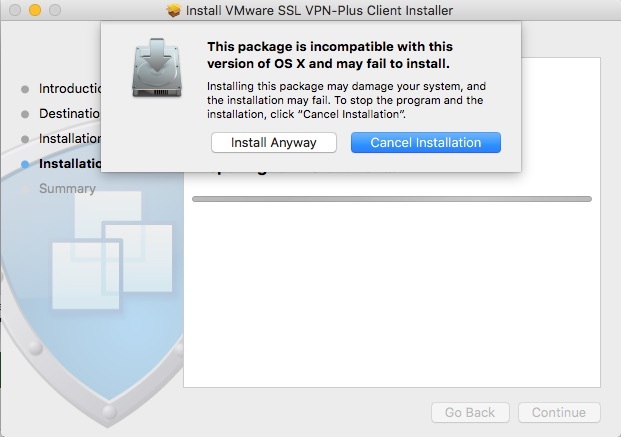 An additional challenge here is if you disable the work around (have System Integrity Protection enabled), as you should, it will result in the client breaking if you run an installer again (say to add another VPN profile). If you need to add another VPN destination you really should just edit the config file /opt/sslvpn-plus/naclient/naclient.conf directly with the editor of your choice. The work around allows the naclient to function on OS X 10.11.2 as well. If you have the client installed prior to installing 10.11.2 update it will remain working, the work around will also preserve the ability to install after 10.11.2. I did all you tell, but it still don’t work. Do i have to modify the files like Mountain Lyon ? What version of Edge Gateway are you downloading the installer from? It must be 6.1.3 or newer in order for you to have a chance of it working on Yosemite or El Capitan, but I would encourage the use of 6.1.5. If you upgraded your NSX Manager you need to make sure you also upgrade the deployed Edges themselves. i’m getting this error on El Capitan 10.11.2 with naclient downloaded from 6.2.0 Edge. I do not currently have any 6.2.0 deployments to test with, and I don’t have the ability to upgrade one of my environments to it as I must stay on the 6.1.x release path.